Every Monday now through the end of the year I am interviewing other artists and crafters in the hopes of spreading some handmade love and appreciation. You can read more about it here. September features makers of baby/children’s items, and October features fiber artists. Like several of the artists I have featured on my blog, I met Arlette Laan at one of my shows this summer. I thought her sock dolls were absolutely adorable and knew I had to get one for the babe. When we met, Arlette was about to embark on a hiking trip with her husband, one of her favorite activities. I was amazed to read just what an experienced hiker she is and to get a glimpse of the adventures she has had. I am so happy to have Arlette on my blog today and share her adorable creations and story with you. 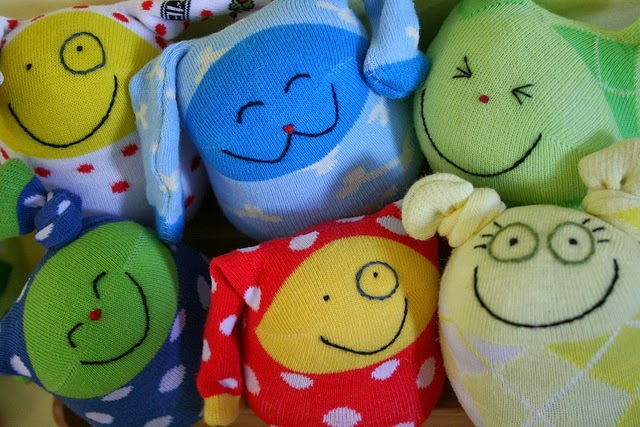 How did you get started making sock dolls? I was always sewing and crocheting growing up and when I started doing shows and fairs with my photography I would introduce some of my dolls. People liked the dolls more than the photography but that particular doll design didn’t offer me many possibilities to be creative with shapes (it was based on a waldorf design). Then one Christmas an artist friend gave me a book on sock dolls (because she liked the photography in it) and once I discovered the possibilities of the sock material I was hooked. I like having my own business because I can set my own times, I can take months off to go travel, I get to do something I like (and also I don’t like people telling me what to do). Ideally I would make all one of a kind pieces and be creative all the time so sometimes it’s a little challenging to make more of a design I’ve already made many of but I try to keep it interesting by using new sock colors and patterns. That’s also the reason I have several designs and when getting ready for a show I try to plan it so that I work on a different doll design every day. I really like putting colors and patterns together and seeing what comes out of it. I like the element of surprise. And I like challenging myself to come up with new ideas, something it’s hard but it’s very rewarding. I think people enjoy the personal connection with the maker and the fact that the item is something special and not mass produced. Personally I’ve bought items because I liked the work and I wanted to support the artist so they could continue to do the work. Also, I’ve had a person buy a set of landscape coasters from me because they enjoyed talking with me and hearing about my travels and the coasters would remind them of that experience. My beautiful wedding band made by Heather Wang. I love that it’s made by one of my best friends who worked with my husband to design something one of a kind just for me. I’m an avid long distance hiker. Before I started my business I hiked the Appalachian Trail, the Pacific Crest Trail and the Continental Divide Trail. Now my husband (who runs his own business as well) and I backpack in the winter months and last year I took August off as well. This year I ‘only’ took a ten day trip but next year it will definitely be a month again. ; ) When I’m home I’m totally consumed with making and selling and it’s challenging to fit a day hike in. I was born and raised in The Netherlands (not Canada). And I’ve hiked about 15,000 miles across the US and in Nepal, Patagonia, Japan, Switzerland, Ecuador, Jordan, Kenya. I’m consider myself pretty lucky to have had all these amazing experiences. Don’t underestimate how much time it’s going to take you and don’t expect overnight success. It happens to some people but most of us put a few years in before figuring out what works and what doesn’t. So don’t get discouraged if at first you’re not making much profit. Thanks for joining me on my blog, Arlette! Be sure to check our her website. Her sock puppets are so sweet! I would have a problem giving to my children because I’d want to keep them myself, not to mention they’d be stained by the time a week was up if I gave it to them. These guys are works of art!